I've always liked making puzzle platformers, but despite having done several projects in Axe in the past two years, I still haven't made a puzzle platformer in Axe, even while several other people have done so. That's insanely slow, even with the water taken out. I hadn't even added anything for the player to interact with yet. Very cool, maybe make the water stop at these movable balls, so that you can seal certain areas. Switches to stop the water? So many features... I would cut some actually. Name the game Breath or Turret, but why mix everything up? I cannot imagine a solid story line yet. Why would turrets try to drown you? Maybe you should be able to fire the turrets at will? You have good character sprites there! Just made a door sprite a couple days ago, so I can add that in soon. It's a sort of a rotating portal-ish thing. Looks cool, I agree with tifreak! I'm kinda pumped to see what you can think up to add to it. After losing and finding my calculator again, and making some odd programs on the side for contests, I'm back working on this thing. 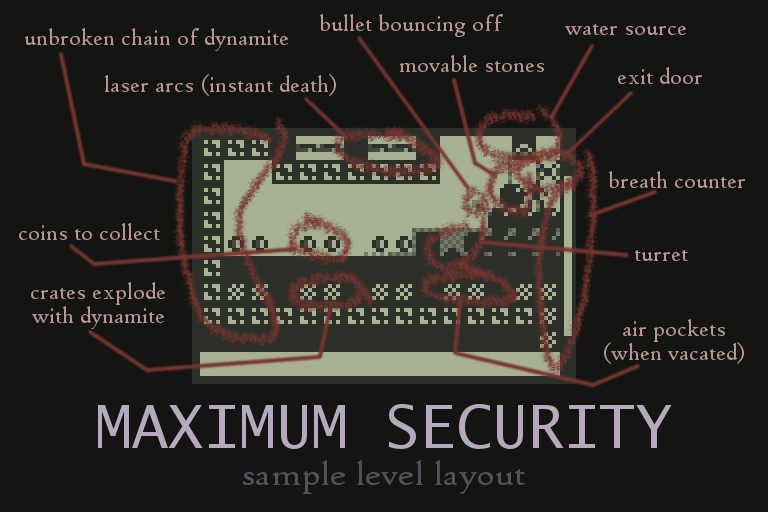 It's got a name now, too, thanks to codebender: "Maximum Security." The idea (that he suggested) is that you're trapped in a maximum-security prison, and all the stuff you see in the level are equipment meant to keep prisoners in check. Something happened that caused all the other inmates and guards to disappear, so now you're alone to fight your way out against the mechanical stuff left in place. Turret (aimed at the player) launches a bullet, which strikes a boulder and bounces off. That bullet then hits the first dynamite crate, triggering a chain reaction that clears all the dynamite and steel crates from the level. Player pushes boulder onto the turret so it's safe to walk by. Meanwhile, water is pouring into the level. As the crates get cleared by the explosion, it flows down the corridors. As the water covers the entire map, it leaves some air pockets which player uses to replenish his breath count. That's amazing. I'm just wondering why a prisoner trying to escape/not to drown would be concerned about coins? Is there an objective yet? To make it to the door? I assume the door's the little spinny thing at the top right? I also love the bubble animation, Does the level filling up with water cause any slow-down? It doesn't look like it from the screenshot. How do you "finish" the level? Is there an exit? chickendude wrote: That's amazing. I'm just wondering why a prisoner trying to escape/not to drown would be concerned about coins? chickendude wrote: Is there an objective yet? To make it to the door? I assume the door's the little spinny thing at the top right? chickendude wrote: I also love the bubble animation, Does the level filling up with water cause any slow-down? It doesn't look like it from the screenshot. Water is actually treated as part of the tilemap, where each tile has a "backside" containing the amount of water there is in that tile. Since the tilemap is a fixed size, so is the water world, regardless of how much water there actually is. NanoWar wrote: How do you "finish" the level? Is there an exit? The spinny thing is the door, as chickendude noted. It doesn't open until all the coins have been collected. Still working on a nice animation to transition from one level to another. I really liked Builderboy's elevator idea, so it might be something similar. Madskillz wrote: I don't think an exit is in place yet. But I agree it looks really cool. Does the water affect the player at all it looks like it does. It also kills you if you stay in it too long (when the breath counter runs out). On the ground, you can move the player with 2nd (jump), Left, and Right. All three experience acceleration—gravity in the vertical and inertia and friction in the horizontal. In water, you can use Up, Left, and Right, and the character floats downward whenever Up is not being held. All movements in water are linear, at a speed about a quarter of the maximum horizontal speed on the ground. There's also an unintended quirk (which I'm obviously going to call a feature) where if you hold down 2nd while moving from a platform in the water, the character will jump out of the water higher when he reaches the surface. Thanks! I still have quite some extra speed to work with (frames still being throttled), so I'm trying to add in little animations like that where they feel appropriate. As I said, each tile has two parts—one for the foreground (the actual tile to display), and one for the background (amount of water being held in that tile). Animated sprites are just sequences of tiles that change in a loop. The water level in each tile is a number from 0 to 6, which represents the number of rows of water (starting from the bottom) to draw. Since tiles are 6x6, this means that the minimum amount of water transferred from one spot to another is a row of six pixels; while this causes some quirks where a 6-pixel-wide column of empty space (such as in the screenshot) acts as a single column of water, it does make water as a whole look a lot smoother than an engine with cellular automata of one pixel each IMHO. The actual routine might also seem a bit odd compared to "standard" water engines. Water always flows from one tile to one to its immediate left or right first, instead of simply falling, and then dumps as far down as possible. I'll post a more detailed description later, probably with the source. That's brilliant! I guess there's also a check for falling water? Since water falls 1 pixel at a time (and adapts to which side it falls from). Nope, I completely cheated on those nice one-pixel-wide flows. That makes a lot of sense, and it would give me another opportunity to add in an awesome explosion Thanks! I'll probably have to redraw those spinning coin sprites then. That looks amazing. It's incredible how much is going on at once! Probably the most awkward place to be—there's nothing I can reasonably cut or optimize further and it seems a bit of a waste to lift the limit for a whole 200 bytes of code. There's no sneaky data bits in your code? I'm often guilty of putting jump tables and things in with my code, for example. Another option is simply to pick a routine that is 200 bytes or more and copy it to saferam and execute it from there. That's what people did "back in the day" and i still do that from time to time. I think I'll just go ahead and add some more features so I don't feel so bad. Is it a nostub Axe program? Would it make sense to convert it to an Ion/DoorsCS program and use some of those routines (like ionFastCopy)? I'm not really sure how Axe works but i assume it just pops the routines you need into the source. Alternatively you could write some assembly routines to do rearrange routines that don't need absolute jumps around. Or you could just add a bunch of new features! In my experience though breaking the 8k limit on the 83+ has been much more complicated. If you've got any suggestions/pointers, i'd be happy to hear them though. thepenguin77 released a library to make it horribly easy to avoid the limit in Axe games. I remember seeing that, but i've always had trouble getting the 83+ side of things to work. I played around with Crabcake and just couldn't get things to work correctly. I'll have to look at it again. Do you have any idea what the REP_NEXT equate is? Disassembling Fullrene shows ld a,a in place of REP_NEXT ... not sure what it does, could be a delay?